I must confess that I have never visited this church on a sunny day. This was the third time I had cycled my way around the Saints, and as on the two previous occasions the sky darkened as I approached. St Margaret is one of just three proper villages in the twelve parishes of the Saints, and my heart sunk as I got closer to it, because I was passed by several cars with wedding ribbons on their bonnets - was I about to be thwarted in my attempt to visit the church? But as it turned out, they were on their way to a reception at the grand St Peter's Hall, which sits just outside the village. I made my way up the graveyard path as the first drops began to fall. The round tower looks rather shabby; and thereby hangs a tale. One of the many state fund-holding bodies to which churches may apply for grants to finance repairs is English Heritage. However, taking the money from them is conditional on them being given a role in future decisions about the building. Here, English Heritage said that the round tower should be rendered; one of their so-called experts insisted that flint towers had originally been finished like this. As the guide to the church observes, complaints poured in from local people and specialist historians alike. The historians called it an act of vandalism; the locals who had to help fund the project felt, not unreasonably, that their money was being wasted. After many protests, English Heritage agreed that they had been wrong, and offered to remove the dubious grey cement and repoint the tower to its original form at no cost to the parish. The parish, after much heart-searching, declined the offer, feeling that the £20,000 of public money required could be better spent elsewhere. The guide concludes that the white tower remains, a unique symbol, to remind us all of the need for more study, more co-operation and a sharing of knowledge, leading, hopefully, to a greater awareness and more careful restoration of our ancient churches. This indictment of English Heritage is all the more damning, of course, for being so carefully understated. 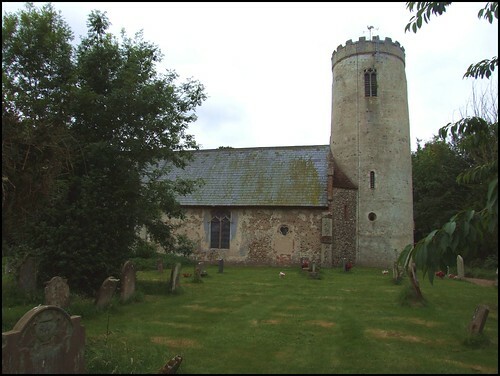 The tower is one of Suffolk's earliest, and the round windows are still visible. There are, apparently, four more blocked ones in the belfry stage. The whole thing probably dates from about AD1000. There is a curious archway to the priest door in the south wall of the chancel which is probably an example of 18th Century 'Gothick', one of those fancies beloved of antiquarian gentlemen of the period, and although wholly ignorant of proper ecclesiological forms, it is a rare thing in Suffolk, and rather lovely too. The interior is entirely restored, and if it is not particularly interesting, it is pleasing. The brick floor and the large windows create a devotional atmosphere full of light and space. The wooden facing of the chancel ceiling is pleasant enough, but I couldn't help noticing that Mortlock found it painted brightly in the early 1980s. Was English Heritage responsible for this 'historically correct' piece of vandalism as well? The one great historical survival here is the set of Royal Arms to Queen Anne with their Semper Eadem legend, and the date 1704. Most of the Saints have graveyards which are designated wildlife areas. One feature I particularly liked here at St Margaret was the list in the porch of butterflies and birds that had been seen in the churchyard. Some eight years after my last visit, I was pleased to see that this list was still being updated, and impressed by how many species are listed on it. This is a hedged oasis full of trees, set in the bleakness of the flat fields. Poor things, it must be the only cover they can get.